Skywatcher Yuichi Takasaki took this photo of deep violet hues in an auroral display. Multiple exposures are made to collect enough light for an image that would otherwise not be evident to the eye. 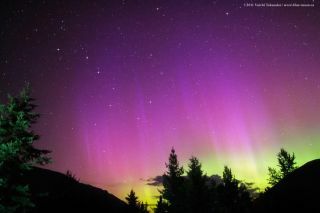 This colorful photo of the northern lights was taken by skywatcher Yuichi Takasaka above British Columbia, Canada. Auroral activity is connected to solar storms on the surface of the sun. The northern and southern lights — also known as the aurora — are mostly witnessed in polar latitudes. A clash of charged particles from Earth's magnetosphere with atoms and molecules of Earth's atmosphere (at altitudes above 50 miles, or 80 kilometers) cause these lights. Solar wind from the sun carries these particles to Earth. Takasaka wrote on his website TWAN (The World at Night) the best way to shoot images of the auroras are from areas where there are view inhabitants. Statistically, March and October are the best months of the year to view auroral activity because of they have the most geomagnetically disturbed days. The colors in an auroral display are caused by altitude of the particles when they collide in the Earth's atmosphere. Violet hues tinged with red and blue in this image occur below 60 miles (100 km). "Usually I could barely see any color, just many vertical lines in white light," Takasaka wrote on the website TWAN. "I quickly pointed my camera toward the north and I was so surprised not only of the sudden aurora activity also of the colors captured in the camera!"